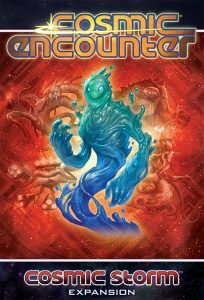 A Guide to Cosmic Encounter’s 5 Expansions! Matt: What a wonderful world of Cosmic Encounters! If we only had spaceships and SPACE (in our hearts) then we might be able to build a better society on the fringes of our fragile galaxy. Quinns: What are you doing Matt, this is a board games thing. Matt: I’m getting everyone in that feel-good 1970’s vibe, when peace and hope and good-vibes ruled the planet and Cosmic Encounter first came out. A decade when man first stepped upon the moon, a famous rock band called Beatles was formed, and everyone had a nice time with flowers. Quinns: I haven’t got time to fix you, Mattt, so let’s move on. 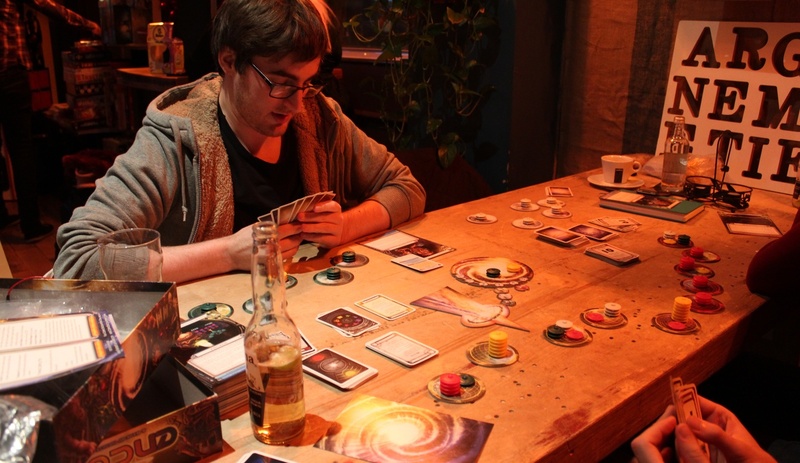 Cosmic Encounter is a brilliant thing. Possibly THE BEST thing, as concluded in our gargantuan Top 25 list at the end of last year, and people who haven’t heard of it should check out this review. But the time for twenty-fives and tops is behind us, and we’re deep into the fog of a cruel Expansionanuary. Matt: That’s true! I can’t even feel my fingers and fear that my extremities may soon be gone. But that darkness is being somewhat tempered by the fact that we now get to write a HOT ARTICLE about every single Cosmic expansion that’s been released to date. Five different boxes of madness that add a total of 115 (that’s one hundred and fifteen) new aliens to the base game – a staggering increase of 230% to the base game’s already ludicrous wad of 50 aliens. But more isn’t always better, as I once learned the hard way with a pack of sugar-free mints. The best expansions add more depth and life to a game rather than just straight-up MORE, and that’s where Cosmic’s expansions really stand out. 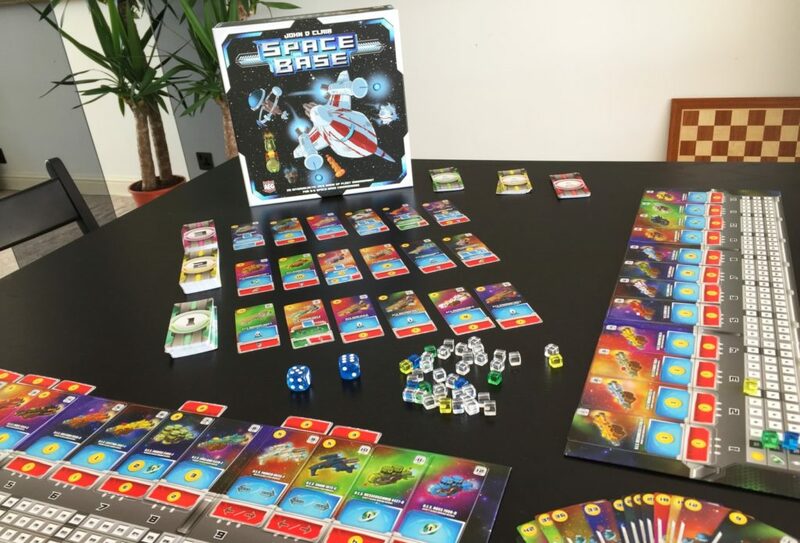 In addition to new aliens and a new colour of plastic UFOs to put in your mouth, each expansion adds optional variants and modules that you can use to mix things up even further. 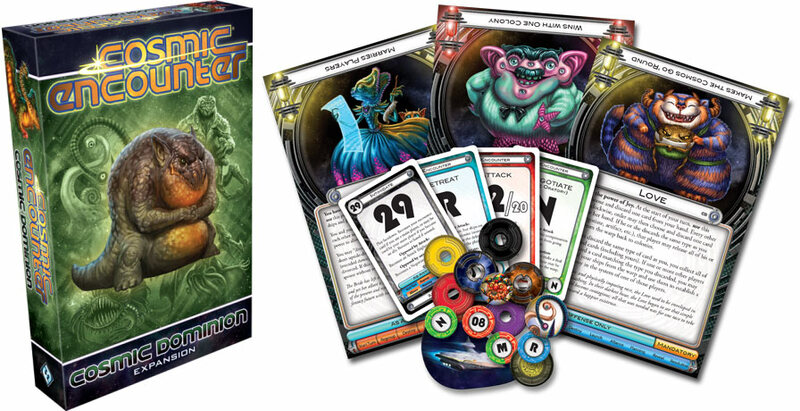 2014’s Cosmic Dominion is the latest expansion, and possibly the only one that’s a true must-buy. The Reward deck is a staple inclusion simply because it makes defending your friends more enticing, by letting you draw cards from a shiny special deck full of the best, worst and maddest cards in the game. The main reason I adore Cosmic so much is because it’s designed to avoid personal feuds, with an emphasis on only helping – or hindering – other players on a strictly cold and pragmatic manner. Risking ships to save someone else’s skin isn’t something you tend to see until the game reaches the point where “oh god he’s going to destroy us all you’ve got to come quickly oh god oh jesus”, so the added lure of special rewards is really just a refinement rather than a variant. Quinns: Yep. 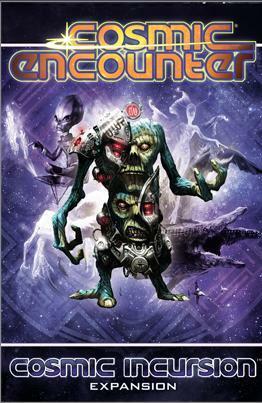 Fantasy Flight’s first expansion, 2010’s Cosmic Incursion, also has a Reward deck, and if you have both expansions then these decks can (and should) be shuffled together for maximum luxury. Simplifying your decision is the fact that Cosmic Incursion’s currently out of print, as well as the aliens in Cosmic Dominion being a cut above the game’s usual space-faring freaks. Dominion was actually a collaboration between Fantasy Flight and the game’s biggest fans, and it shows. The Tourist has a little cruise ship token that flies around the table. The Quartermaster gives its player a role something like the banker in Monopoly, if the banker in question was a drunk uncle, alternately cheating and tipping himself for any services rendered. The Voyager can send their planets to the Warp, traditionally the home of defeated ships. But wait! There’s more! 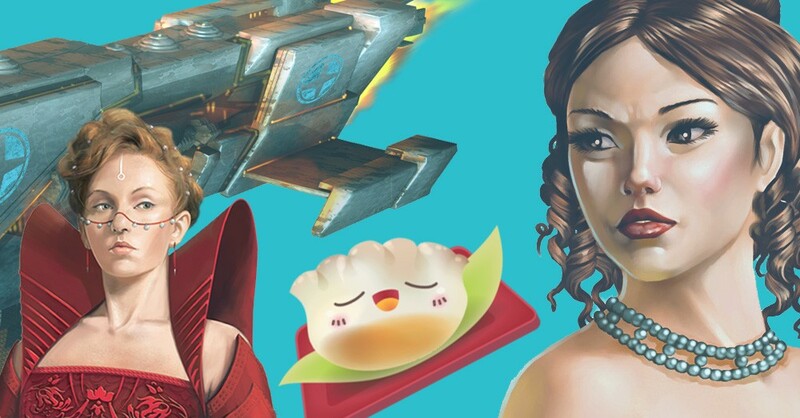 Included in the manual are teeny little variants for flagships and salvage ships, both of which – rather than fattening up the game with nonsense – actually give advanced players more control over the proceedings. Matt: The new rules that arrived next, in 2011’s Cosmic Conflict, feel a little wackier to me, and I’m not sure how I feel about them. Mirror Universe turns the discard pile and draw deck upside down, meaning the draw pile is now the discard and vice-versa, with players enjoying a creeping sense of deja vu as they play all those same cards again. 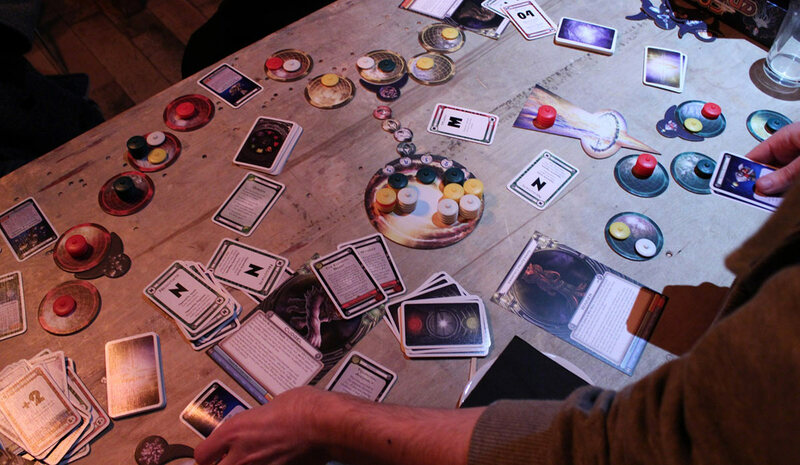 Psychic Switcheroo sees players swapping alien powers for a hot minute. The Entropy Beast eats planets. We don’t like to talk about The Entropy Beast. It’s not safe. Matt: I find the Hazard Deck pushes things too far into the realm of random for my personal tastes, but I’m particularly fond of the Saboteur – one of the aliens that Cosmic Conflict adds. You start the game by placing tiny discs in front of every single planet in the game, a few of which are DANGEROUS BOMBS. The rest of the game is then a weird power-trip where you’re constantly forcing people to invite you as an ally in exchange for information on which planets aren’t explosive. It’s basically like being a tour guide who works for the mafia. Of course, the other side of the situation is that you need to remember which planets you’ve rigged – which leads to the likelihood that you’ve devised a system that’s easy to remember, which leads to the possibility that other players might suss out how you’ve placed the bombs. It’s a very, very good time. Quinns: 2012’s Cosmic Alliance, a.k.a. “The Bad Expansion” is by no means bad, though it is Fantasy Flight flying exceptionally close to the twin suns of “Hey, We Can Put Hardly Any Thought Into These Boxes And People Will Buy It.” It’s certainly the easiest to skip. 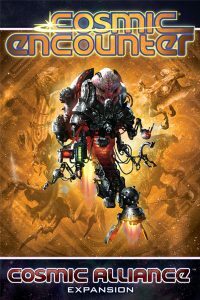 You get your 20 aliens, and you get your new colour of ships & planets so the game can support an extra player, and… you get some extra cards to shuffle into the main deck if you want to play Cosmic Encounter with 7 or 8 players! Just one problem there. 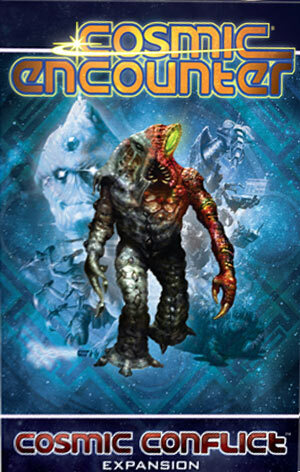 I don’t think anybody does want to play Cosmic Encounter, a turn-based game, with 7 or 8 players. Oh, and there’s also a variant to play a 6 or 8 player game of Cosmic in teams of 2, though you can probably guess the rules yourself. It does have The Horde going for it, though. An alien race with the power to breed explosively, The Horde slowly covers the table in adorable little Horde tokens. Gawwww! 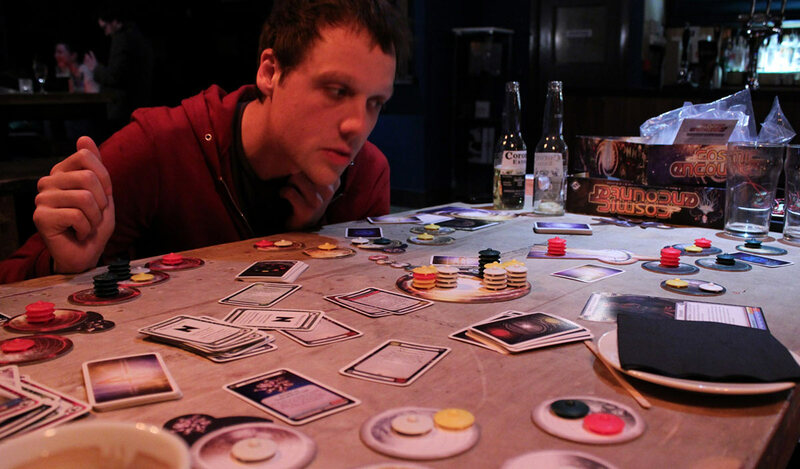 Matt: For my money the second must-have expansion is probably the fourth, 2013’s Cosmic Storm. Basically, everyone gets a space station. 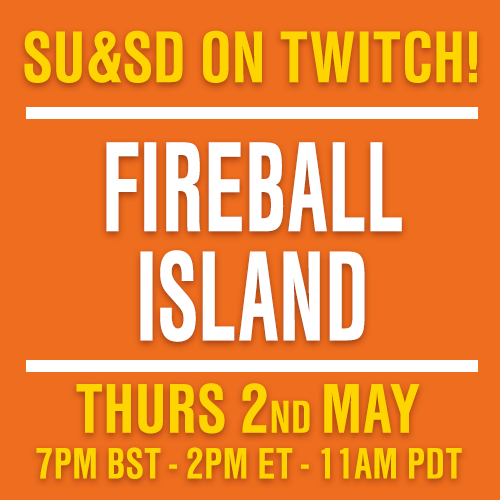 Everyone! Everyone gets a space station! It’s the socialist dream! Quinns thought that some of them were more boring than others, but as a Cosmic geek I was ruddy excited about all of them for different reasons. Quinns: A space station is baaasically a smaller power in addition to your race’s power. Same as how players lose their alien’s power if they lose a majority of their planets, you flip your space station card over if you lose the planet it’s mounted on. Except space stations can also be traded during negotiations, which is awesome. Matt: Stations aren’t a straight-up replacement in the way that the Rewards deck tends to be, but for me the space stations represent a better alternative to the vanilla game’s Tech cards. As much as I’ve always enjoyed the process of getting to pick a cool technology after you’ve chosen your alien, actually upgrading and using Tech seems to be something that always gets forgotten about. Inexpensive tech simply isn’t exciting, while going all-out to DEPLOY THE LUNAR CANNON is the most exciting thing anyone can ever do with their life, but tends to be such a huge commitment that most players don’t even bother trying. 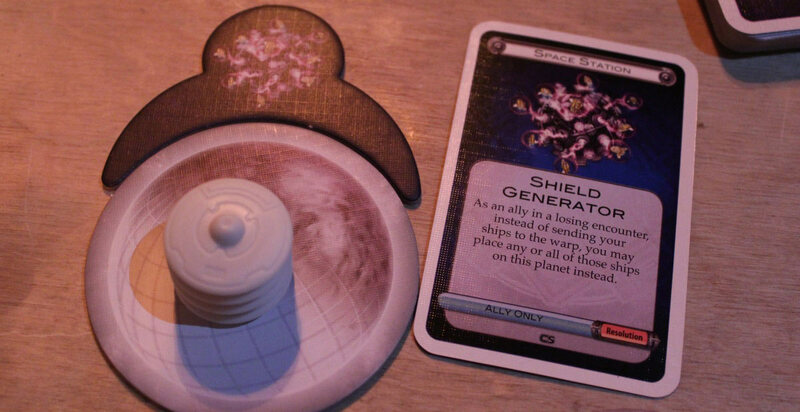 Space stations are in action immediately, and provide the same buzz as a good tech card. Don’t attack Brendan, man – he’s got a bloody Big Space Laser. Quinns: I’m just looking at some of the aliens it came with now, and you’re right- this is a great box. The Sycophant can win by repeatedly flattering the player who goes on to win the encounter. 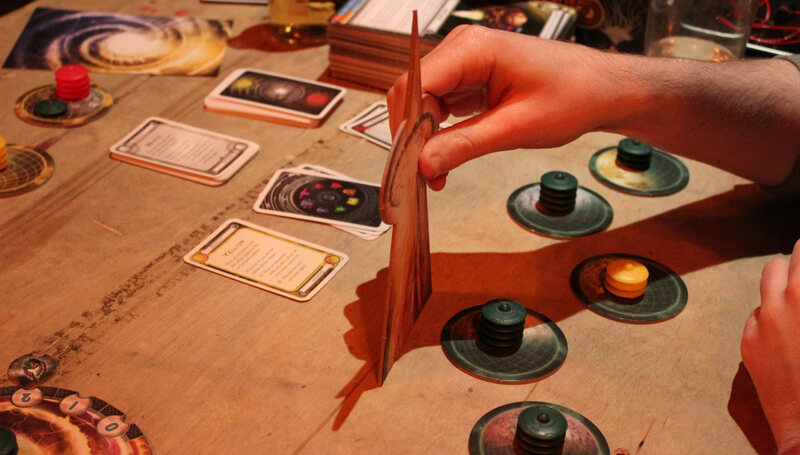 The Swindler can perform a last-minute feat of identity theft, swapping EVERYTHING (including their alien, hand of cards and real-life seat) with a mark they chose at the start of the game, though the mark then wins if they can keep this identity thief from winning for just a few turns. The Tyrant can turn a player into a slave, but only by winning enough encounters with them first. Man, I’ll tell you what. 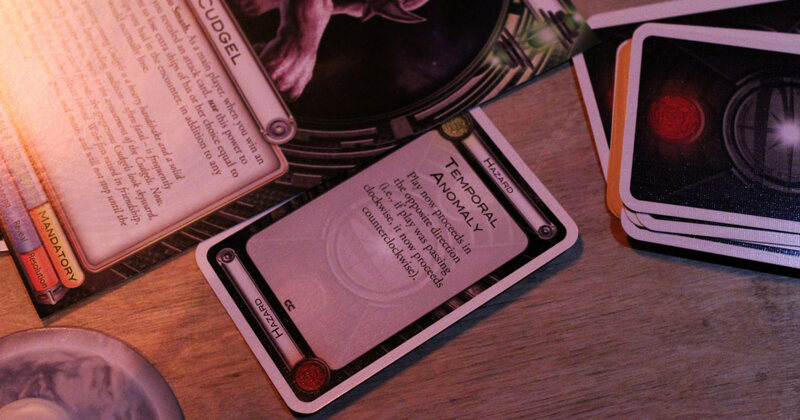 A good alien in Cosmic Encounter isn’t just a fun feature. It’s a brilliant concept for an entire board game. Matt: You also get 25 new aliens in Cosmic Storm, which is five more than the standard 20 from the first three packs. If we’re standing in a purely pragmatic position whilst wearing a tight pair of value-socks, it’s hard not to resist the temptation to skip some of the earlier expansions and pick up this. But then, the first three expansions also add a new colour of ship, which this doesn’t. Ack! Decisions! Being a consumer was never so torturously varied. Quinns: So, where does that leave us? We recommend buying Cosmic Encounter (though at the time of writing it’s between print runs). 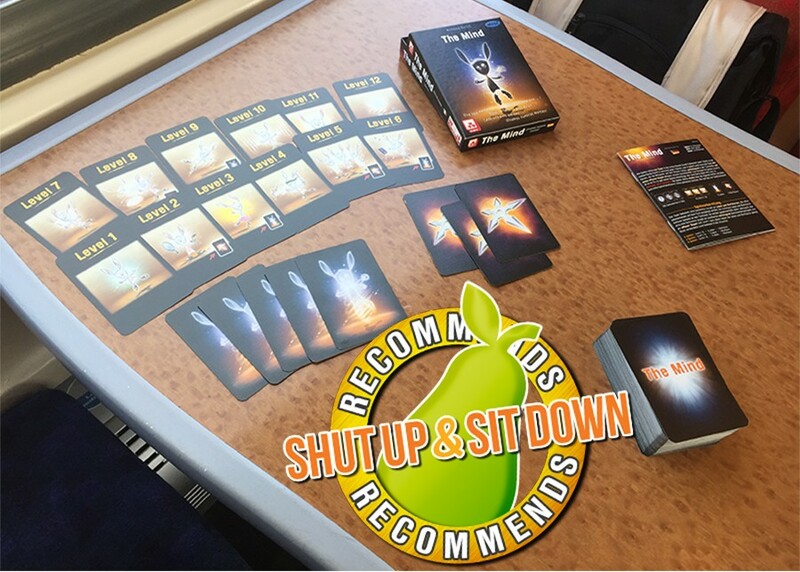 If you’re enjoying it we can recommend the utterly fantastic Cosmic Dominion to make this game all it can be, followed by the inventive Cosmic Storm. If you fall in love, after those two you want Cosmic Conflict, Cosmic Incursion and Cosmic Alliance, in that order. At which point your copy of Cosmic Encounter will be so heavy that it won’t be wise to travel with it, but that’s ok. People will come to you!